"I have been on a permanent quest to find the perfect quiche recipe. As a self-professed breakfast food, cheese, and egg lover, quiche represents to me all that is right and good in a culinary concoction. Traditionally quiche is not a healthy option, what with all the cream and cheese that typically goes into it. I have literally experimented with different versions of a healthier quiche for years, but a couple of weeks ago I stumbled upon the perfect mixture, and I am pleased to share it here with all of you." Preheat oven to 325 degrees F (165 degrees C). Unroll pie crust and press into an 8-inch pie dish. Heat olive oil in a skillet over medium heat; cook and stir green onions until wilted and beginning to brown, 2 to 3 minutes. Remove from heat. Spread ham over prepared pie crust and top with green onions. Whisk egg substitute, evaporated milk, and mozzarella cheese in a bowl. Pour over ham mixture. Sprinkle with Parmesan cheese and garnish with chives. Bake in preheated oven for 20 minutes. Increase heat to 350 degrees F (175 degrees C) and continue baking until quiche is browned, 15 to 20 minutes. Remove from oven and allow quiche to rest until eggs are set, about 30 minutes more. Loved this quiche. 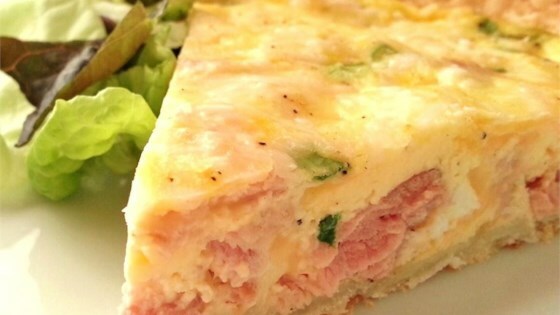 It is a "heavier" quiche with the meat and the evaporated milk.